What's next for the nation's roughly four dozen MVNOs? Remember, in 2007, when the MVNO died? In a series of high-profile flops, Disney Mobile met its untimely end just a few months after Amp'd Mobile went under. Those followed the demise of Mobile ESPN the year before. Yet the mobile virtual network operator model--or at least its spirit--is definitely not dead. In today's iteration, the MVNO is more similar to what was originally known as the wireless reseller--firms that bought buckets of airtime from carriers and resold them to customers. While the high-profile MVNOs of yesterday such as Disney Mobile and Mobile ESPN tried to market wireless services to high-ARPU customers using their well-known brand as a draw, the reseller primarily focused on selling wireless services to underserved markets. Today dozens of wireless MVNOs continue to crowd the market. 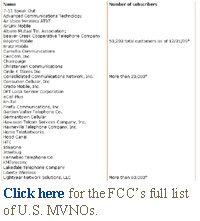 According to the FCC, the number of MVNOs in the United States actually doubled during the past several years. In the agency's 14th annual Mobile Wireless Competition Report, there were at least 60 U.S. MVNOs operating in the first quarter of 2010, up from the two dozen it counted in its 11th report, released in Sept. 2006. Further, there are even inklings that the MVNO model is shifting away from voice to a more data-centric experience. However, analysts--and even representatives of the MVNOs themselves--cautioned that traditional MVNOs will not be able to make the data model work overnight. "They still exist because they go to micro-niche audiences," said William Ho, an analyst at Current Analysis. "They don't have huge market share, but they serve a certain need." The big MVNOs that flopped, he said, went after high-ARPU users and tried to extend a major brand into the wireless market. "The smaller guys are still working because they have favorable wholesale agreements and work in a small, niche market," Ho added. While the industry is littered with the remains of fallen MVNO giants, there are still many in operation, including TracFone's Net 10, Jitterbug, Firefly Communications, Page Plus Cellular and others. Omar Abhari is the senior vice president of operations at PlatinumTel, one of the MVNOs that has survived. The company, which has been around since 2001 and operates on Sprint Nextel's (NYSE:S) CDMA network, has stuck around for several reasons, Abhari said. For one, the company developed its own software suite for OSS/BSS operations. Additionally, Abhari said, PlatinumTel worked to make sure its retail operatives were being compensated well, its carrier partner was getting paid on time and that it was making enough money to operate its business. The MVNO flops, he said, "couldn't manage that equation very well. They got caught owing the carrier a good portion of money." PlatinumTel, like many MVNOs, does not provide its subscriber numbers. However, Abhari said that since it added a $50 unlimited voice and texting plan to its pay-per-minute and hybrid plans in September, the company has seen its subscriber base double. The company sells its products in more than 1,200 independent retail stores across the country. Another MVNO that's still churning along is kajeet, the brand focused on the tween market. Daniel Neal, kajeet's CEO, said the company has survived because it focused on prepaid and addressed an underserved niche. When kajeet launched in 2007 it was the only contract-free wireless service with parental controls and GPS phone location. Since launching, because of a liquidity crisis the company has transitioned from a retail distribution model to a direct Web marketing operation. The move hasn't been all bad, Neal said, noting that the company has doubled its subscriber acquisition efficiency in the past year. Kajeet does not give out subscriber numbers. "We've seen growth in the types of subscribers we're really seeking to acquire," Neal said. "Where we've focused we've seen really good growth." 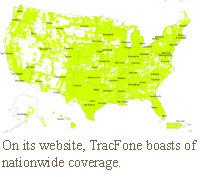 The biggest outlier in the MVNO market though is TracFone, which is a subsidiary of telecoms giant America Movil. Although Tracfone operates different brands, including Net10 and Straight Talk, Tracfone is primarily one brand and continues to be successful, said BTIG analyst Walter Piecyk said. TracFone has deep roots in the MVNO market, and has seen its subscriber base explode. According to the FCC, TracFone had 6.1 million subscribers at the end of 2005 and 14.4 million at the end of 2009. The company benefits from America Movil's scale, Piecyk said, noting that TracFone has a lower cost-per-gross-add than most MVNOs, and that TracFone's parent company buys more phones than Verizon Wireless (NYSE:VZ). However, much of TracFone's recent momentum in the MVNO market comes from its Straight Talk prepaid unlimited service, which it sells through Wal-Mart. The company began offering the service on Verizon's network last fall. Recently, the company expanded Straight Talk with GSM phones from AT&T Mobility (NYSE:T) and T-Mobile USA's networks. When TracFone launched Straight Talk, "a lot of people looked down on it," Piecyk said. "It was new. Why would Verizon enable a competitor? Now, a year later, you've got other operators jumping on that bandwagon." Interestingly, though, competition in the unlimited, prepaid space highlighted by Straight Talk appears set to get even more intense as the big guys move into areas once the sole domain of MVNOs. Verizon last month began testing a $50 prepaid monthly unlimited plan across the Southeast. Last year Sprint purchased Virgin Mobile USA--one of its own MVNOs--and has made it one of its prepaid brands. Sprint also has been pushing Assurance Wireless, a prepaid brand focused on low-income subscribers. T-Mobile USA too offers a $50 unlimited talk and text service. "It becomes more competitive for a smaller MVNO that thought they were attacking a niche to be competitive and relevant in that market," Piecyk said. While competition continues to remain heated on the voice side of things, it appears the next frontier in the MVNO game centers on data. 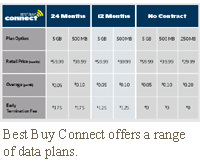 For example, Best Buy recently inked deals with Sprint and Clearwire (NASDAQ:CLWR) to provide 3G and mobile WIMAX service, respectively, through its Best Buy Connect Service. Additionally, Leap Wireless (NASDAQ:LEAP) last week inked a five-year, $300 million 3G data roaming deal with Sprint, effectively becoming an MVNO. And LightSquared is in discussions with more than 30 companies--including wireline operators, cable operators, rural carriers, retailers and device makers--for its wholesale LTE network, discussions that could result in the creation of new MVNOs. However, analysts cautioned not to read too much into the recent developments. Ho said the Best Buy deals represent an attempt by the retailer to increase the stickiness of its brand, and attempts by Sprint and Clearwire to add additional customers onto under-used networks. "We don't see AT&T and Verizon doing that," he noted. "To establish an MVNO model for data is very difficult," Piecyk said. "I don't think you're going to see an unlimited data plan for an MVNO." Indeed, MVNO Zer01 famously flamed out after promising an unlimited voice and data plan. Piecyk said he doesn't think AT&T and Verizon--which are working to expand their data revenues while limiting network congestion--will want to extend data services to MVNOs. Nonetheless, MVNOs across the board are looking to data-capable smartphones as a way to expand their businesses. Abhari said PlatinumTel will launch its first smartphone, the Kyocera Zio Android phone, in the fourth quarter of this year. He expects customers who prefer prepaid plans will be willing to pay larger up-front costs for the device. However, Abhari said he believes the traditional, voice-centric MVNO model still has a lot of room to grow. "I think the two can coexist," he said. "We have plans to be data-centric and get in step with the times, but we're taking steps to get there as the market evolves." Neal sounded a similar theme, and said kajeet will introduce its first smartphone next quarter. "Clearly there is that trend," he said. Ho said the MVNO market likely will transition from voice to data at some point, but such a move won't happen quickly or smoothly. "Unless you have deep pockets, you won't see a lot of data MVNOs because it's a competitive issue right now," he said.